Tasty and appetising. Ideal for trampers and hikers, and also an attractive topping for iced cakes. 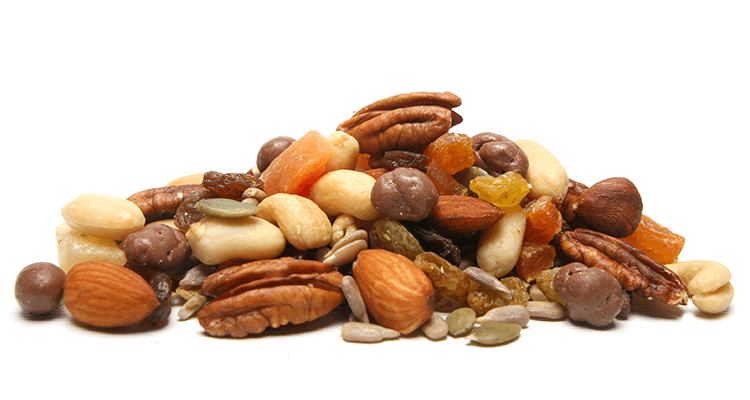 Contains roast peanuts, raisins, sultanas, sunflower seed, diced apricot, fruit medley, papaya, pineapple, chocolate raisins, roasted cashews and pecans plus raw pumpkin seed. Peanuts, Raisins (Raisins, Sunflower Oil, Preservative (220, contains Sulphites)), Sultanas (Sultanas, Canola Oil), Sunflower Seeds, Apricots (Apricots, Rice Flour, Preservative (220, contains Sulphites)), Papaya (Papaya, Sugar, Preservative (220, contains Sulphites)), Pineapple (Pineapple, Sugar, Food Acid (330), Preservative (220, contains Sulphites)), Pumpkin Seeds, Milk Chocolate (Sugar, Milk Powder, Cocoa Butter, Cocoa Mass, Anhydrous Milk Fat, Emulsifiers (Soy Lecithin, 476), Flavours), Cashew Nuts, Almonds, Pecan Nuts, Hazelnuts, Sunflower Oil. Milk Chocolate contains 35% Cocoa Solids, 30% Milk Solids. Contains peanuts, milk, soy, sulphites and tree nuts. May contain traces of egg, gluten, sesame seeds and other tree nuts.